Cameo Planning: Scenery Is A Model Too. As I consider the scenery for the cameo, I want to move beyond the generic textures, colors and materials that look like everywhere and nowhere. Different regions have their own identifiable sense of place, that’s characterized by soil types and color, native plants and growth patterns. To truly understand a subject you need time to become familiar with it. A photo only shows the surface of things and is a poor substitute for actual experience of a place. While I’m fortunate to have my inspiration close by, there are other ways to push for the deeper knowledge I’m suggesting. One-way is to take an image and sketch what you see. Think of this as interrogating the photo. You are actively asking questions of the object that take your understanding further. We do this with rolling stock as we build. How does the siding fit at the car ends? How are the exterior posts spaced? What size is this, how does that relate to those and so on. What I’m suggesting here is no different; we’re simply applying it to an unfamiliar subject that will, in time, become familiar. Regardless of how crude the sketch may be, there is value in the exercise. This image represents the effect I’m after. It isn’t obvious in the photo but the areas around the track is anything but flat. 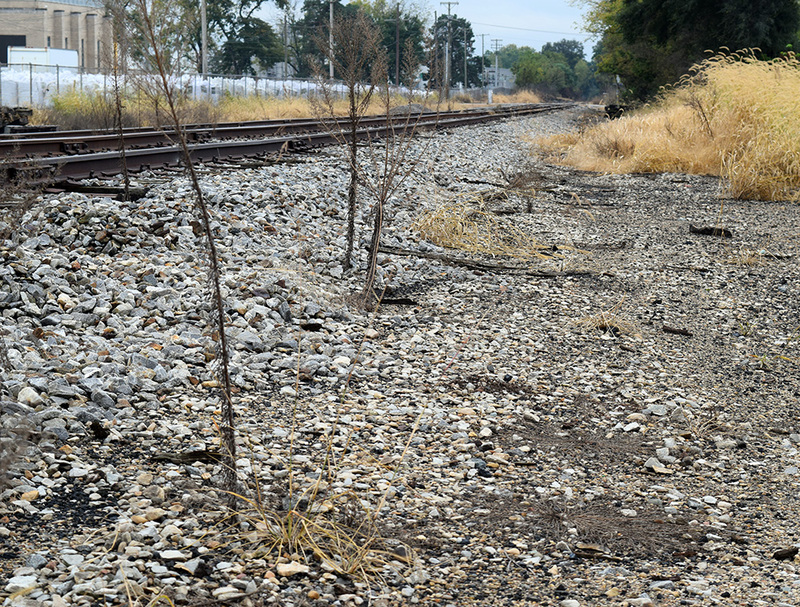 The old roadbed is rough and uneven with several low spots that are a mix of dirt, cinders and ballast fill. Both tracks are higher with the siding slightly lower than the running line. The straw colored tall grasses are the dominant cover plant. To get the impact on a model, I need to capture their mass and volume. The trees form a backdrop on the right side of the track, while the opposite side has a more open quality. I also need to pay attention to the colors and textures of the area and materials. Small things like this are like the details on a freight car. You can go with an impressionistic look via cast on and moulded shapes or take the time and care to apply correctly formed separate pieces. Modelers will go to great lengths to reproduce a specific piece of rolling stock or structure as accurately as human skill can manage and then place it in the most generic of settings. Scenery can be a model too. 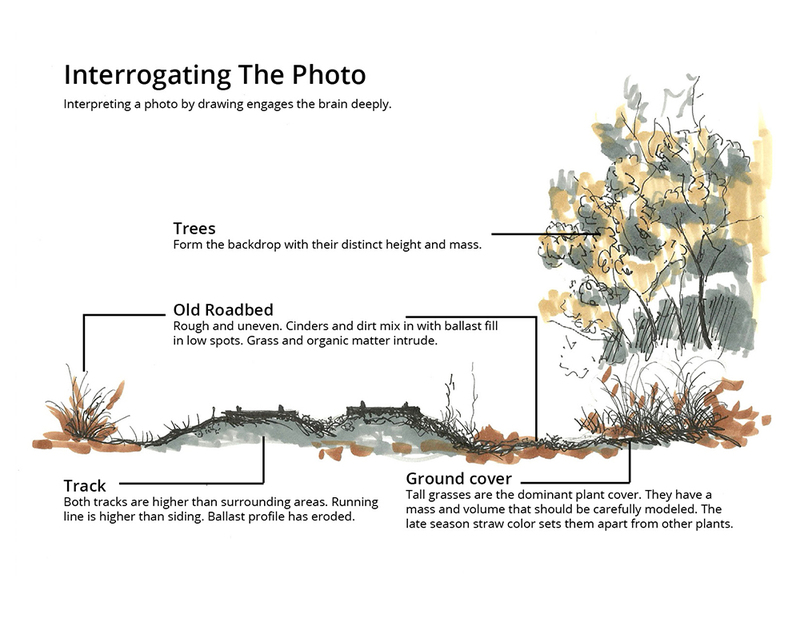 A tree is a prototype, so is groundcover. The contours of the land are like the basic dimensions of a freight car. Get them right and the other details will fall in place. Get the basics wrong and nothing will look right. This approach won’t suit every taste but it’s there for anyone willing to make the effort. As with other aspects, you make a choice about what means more to you, something generic and quick, or an expression that is more meaningful. The quality of your experience with the craft is the sum of many such choices. For many “modellers”, scenery tends to be the one area where they actually have input: ready to lay track on which runs ready to run equipment, past ready to play buildings. And what do we see? Grass mats and puffball trees. Or unsubtle variations in the surface and foliage mat trees and bushes, maybe with some “ground cover”. I suppose that if one’s interests lean heavily towards operations, then that is reasonable but I wonder if by this point the hobby isn’t modelling railroad operations rather than modelling of railroads, which may not even see movement in the case of a small diorama. Most modellers who are concerned about the fine detail side of things are at least aware of the operations side of things, often with as great an interest in the detail as they have got the physical assets. I wonder what we (as finescalers) can do to get the benefits of observing nature in creating a better looking setting for the operationally minded enthusiast, such that the scenicks are balanced against the equipment. Or are we just peeing into the wind, if I may be slightly coarse about it? You may and I suspect we would be. I’m no longer trying to convince the people who have zero interest in these things. That’s a waste of everyone’s time. I’m simply sharing what’s of interest to me and to others who see the value of it. I don’t think you’re peeing in the wind, Simon. The hobby attracts a lot of people with varied interests. Many seem mostly happy to have minimal scenery. Many build nice models but don’t consider the effects of weathering. Many use generic products. I think, if you wish to help move these modelers (or in fact all modelers) forward in terms of realism, the best way is to continue to introduce them to higher quality work. Many simply don’t know better; the mainstream model press does not heavily focus on the fine detail side, perhaps because those articles don’t sell issues or maybe also because many who do actually work at that level don’t write articles. We all start relatively at the same place: a train set up on plain boards or the floor. We eventually discover magazines and our view improves and maybe our modeling, too. But it’s easy to stop there and be happy. There is no challenge to push further. People tend not to criticize each other’s work, to overlook the glaring issues. There are many social/personal reasons for that. My experience is that you have to seek out critique and that the best modelers do. You look for the best models out there and find what you can add to your own work. And you look at the prototype for inspiration and a reality check. Like any endeavor, you can’t improve in a bubble of like-minded individuals. And as you improve, you share. I would love to see something similar to the critiques in art school: A safe gathering of individuals to discuss recent works, provide input, help drive improvement. In the end, we need to share, to expose, to educate. People will either get it or not. Thank you for your comments, guys, which were all I hoped to hear. Sometimes I like to ask about the elephant that everyone else is busily ignoring. I think it vital for the more serious side of the hobby that we continue to blog, and show the possibilities that our adult oriented approach to it, so that others within and without can see an alternative approach to our pastime than simply playing trains on an 8’x4’ or replicating operations in a “basement empire”. I also think it vital that we continue to ask ourselves about why we blog. We can’t “force a conversion”, but we can facilitate a conversation and also, why not simply share our successes and failures so others don’t feel like a lone voice in the wilderness. Ours is not the only path, just the one we like to follow. Dave, I often advocated this attitude, but it is incredible how the instant gratification and auto-congratulation mentality is taking root at a fast pace. As you mentioned, many will take it at a personal level and feel it is simply bashing which it isn’t. However, art critique is a great tool to improve and get better. I don’t regret going through that process for five years when I was studying at a school of architecture. That said, I once did the experience with a fellow modeller. We went on a popular Facebook model railroading page and made critique of what we saw there. The goal was to highlight the strong points, understand why some elements didn’t look right and what could have been done to make it better. It was surprising how many layouts would have looked great if only a few elements had been altered (colors, textures, cluttering…). Many will argue this is only a hobby, which is true. However, it would be interesting if a critique platform existed for people eager to submit themselves to such a process. Given the sheer amount of energy we put into our modelling, isn’t it weird we blindlessly walk in the fog? Some “real feedback” would be welcomed from time to time. I’ve often encountered this mindset in other modelling communities (particularly scale figures) when others would kindly provide advices, point out flaws and how to improve the results. It was done in a friendly yet serious way for the betterment of the community. Not perfect, but you learn a lot. Another nice thign woudl be to have layout critiques in the press. It’s always from the owner’s perspective or done in a very matter of fact way. Interesting, but very little to learn from that after a while. Matthieu, I agree about the instant gratification/auto-congratulation. I think this is part of what we are as social creatures, for better or worse. We fear opinion; we hate criticism. I think it’s because we are, as a whole, badly prepared to do it properly. 90%+ of the feedback I’ve received in life focuses on the mistakes. Yet repeated attempts with failure is the only path to success. This advice adhered to a time-honored art technique of looking at a painting in process upside down or in a mirror to see if the design holds together. To break the artist from the confines of his intense focus and self-delusion. The key is stepping back and really looking dispassionately at your work. Hand-in-hand with that I steal another idea from the art world: look at and copy the masters. A lot. Continuously. They have solved so many problems for us. Copying opens our eyes to those answers they give. Finally, you hint at one other critical item: look to modelers following other topics. Figure modeling, yes! For me armor and airplane modelers also open vast opportunities to learn what almost no one in our hobby has achieved. (Their choice of small subject with a focused story argues a lot for the cameo layout, by the way) And finally, look to others in the hobby, in my case it has been English and Continental modelers, especially those in 1:43.5 industrial modeling. They are breaking ground in ways unknown over here. A critique group needs to contain people who are interested in both giving and receiving, who agree to provide honest input in a productive way and who will take feedback. It needs to focus on raising everyone’s level. Most important, it needs to be about trust and respect. We can learn from everyone’s work, even work that maybe we see as substandard because it can teach us mistakes to not make. I doubt this kind of critique would happen in the press, but I’m one of those who love to see the process of construction in layout articles as it reveals a great deal. I’d love to see more of why a modeler chose a certain path, who the influences on his/her modeling is, mistakes that were made and did it meet expectations in the end? How many of those featured layouts actually are completed? How many run as planned? How many end up as dusty remnants? I think the best setting for exchanging constructive comments is an online forum where a limited group of ambitious modellers participate. It should be a place where only registered users are allowed to post. And to become a registered user, some form of application should be reviewed by the moderator. Already registered users could also invite people they feel would have something to contribute. Judging from the blog postings by Mike and the comments he receives, it seems that the OST Publications website would be a very good umbrella for such a forum! That’s an interesting suggestion which I will leave to Mike, but as far as I can see there are two types of blog: those which allow comments or even encourage debate, and those which act as a showcase for the blogger. The latter is just an ego trip and worth avoiding, but the former has some of the format of a forum, but only the owner can initiate new topics. Two solutions to this: create a forum, or share links to other blogs. Having been involved in running a popular forum and establishing another, I can only say it’s a brave man with skin thicker than a rhino who starts running one. It doesn’t matter how you “vet” applications, some will turn out to be a pain in the rear end. There is a forum that fills the criteria I have listed. This is the Westlake Publishing Forums moderated by Russ Reinberg. There is a very limited group of people that are active, but among them there are several very talented modellers. The discussions are always constructive and the overall tone very friendly. Constructive comments are offered and recived. I remember only one incident in several years when tempers flared up a bit and Russ had to intervene. But I agree that this is the exception rather than the rule for online forums. Even if there might be less than 50 active posters on that forum this is the forum that have teached me the most as a modeller. Before this topic gets out of control, let me nip it in the bud. I will not be starting a forum of any kind on this site. As many of us have experienced, forums eventually default to the lowest common denominator and need constant monitoring and supervision. As a one man shop, my time is better spent on ensuring the quality of the work at hand. Regards to all and thank you for a delightful comment thread. You guys lift this blog out of the ordinary. I like the comparison of modelling scenery as we would if building a model of a freight car. How would we build an accurate model of a tree? Not the same as how do we create a very detailed model of a tree. How do we learn to represent soils or even ballast at this exact place with the same attention to accuracy as we invest in finding the “right” shade of boxcar red? A cameo presentation like what you’re constructing offers such a rich oppprtunity to truly model a location as it is and on such an expansive canvas to explore this work. 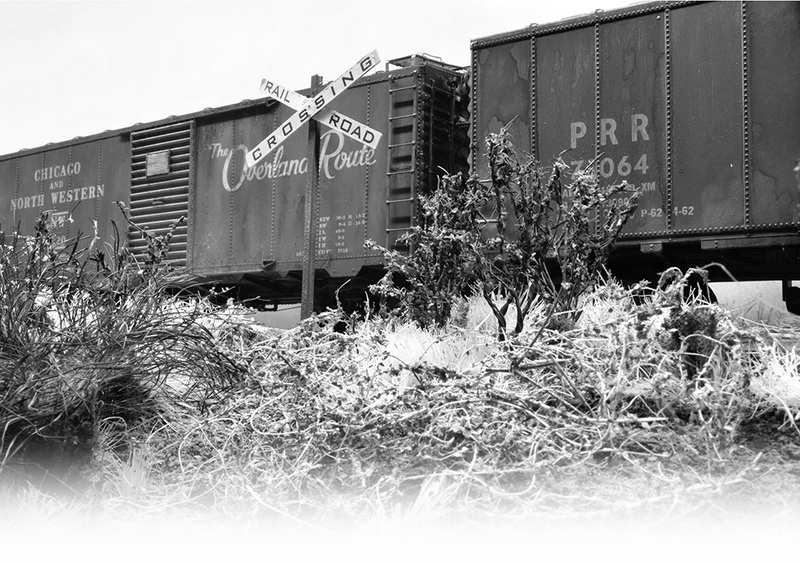 It is a new frontier in model railroading and one we haven’t explored yet. We have invested in the techniques or skills but not in terms of their application when it comes to modelling exact scenic elements such as a model of a particular tree the way it was, that day. And those illustrations you’re creating to plan the scenery are beautiful. So much so, they stand on their own regardless of their relationship with the model. In the 1970s, the BBC produced a series called “Model World”. There was a book published to accompany it, which is a much-treasured possession from childhood. In the model railway section was a list of does and don’ts. One which stuck in my mind – and we are talking over 40 years here – was the advice to always model from the prototype, even a tree. Interesting that such thoughts go back so far – and probably even earlier.